In 2012, NEC and some of their partners conducted some research in to the ever-evolving digital signage industry. 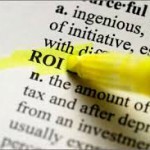 The focus of their study was Return on Investment (ROI) which is a common measuring stick for many capital investments. Although the findings have collected dust over the last few years I would venture to guess that, if anything, individuals and companies are realizing their return even quicker given the increase in options and decrease in hardware costs. Shed in another light, 42.3% are breaking even in a year or less and 69.2% are reaching that mark within 18 months. This data does nothing but support the notion that digital signage can be a boon for your business. Of course there are a number of factors that determine how quickly each company would reach this point (i.e. type of system being used, established business or start-up? Internal resources being applied to the network of screens, etc.). On the flip side is “how” digital signage is saving them money, making them money and increasing customer satisfaction. Centralized control of content- True solutions not only allow for the playback of dynamic content but they also provide the content management and scheduling capabilities as well. Further, some act as a repository for all of your signage needs. What this means is that by simply logging in with a user name and password, you can have access to all of your media items and/or bring in new components. Naturally, the result is a much more fluid process. Lower costs to make design changes- One of the “big-wins” of digital signage is that you no longer have to reproduce graphic after graphic or poster after poster. Using the tools alluded to above, you’re a few clicks away from updating your content. What used to cost you a minimum of $50 for a new poster, now costs you nothing. Now multiple the $50 by number of screens and frequency of changes. Increased sales of promotional items- Sales and promotions are the quickest ways to spike your sales. Because of the inhibiting nature of printed signs, many regulate their promotions and sales to a few a year. This isn’t to suggest that you should go crazy because of your new-found capabilities as you’d find yourself cannibalizing your profits, however you can easily add a few more and attempt some that have never been done without the risk of losing money on the design, printing and distribution of a flop. Improved operational efficiency- With the right system, all the needs of design, content management, scheduling, deployment, and IT can be met without adding any warm bodies. In addition, all of this will reside under one umbrella thus eliminating the “too many cooks in the kitchen” and “death by meeting” scenarios many companies find themselves in on a daily basis. Increased foot traffic- Shiny object anyone? In its most rudimentary form, digital signage is one of those flashing, changing, eye-catching mediums that draws people’s attention. You have to be careful with this “power” because using content that has a staggering amount of motion will actually have a negative impact. Deploying the content in a modest way will certainly draw more than it repels. Increased margins- By now, you may have probably noticed that each one of these factors has an affect on the other. It is because of the centralized control, operational efficiency and lower costs to make design changes that margins thrive. You are able to focus on particular items and place them directly in the “minds-eye” to influence purchasing decisions in the direction of your high profit items. As I mentioned earlier and as Bill Gerba expresses in his informative blog, “there are so many different business models that a digital signage network owner could subscribe to, it would be impossible for me to cover all of the different ways to calculate ROI.” With that said, the onus often falls squarely on the end user(s). If you “build it” and simply expect them “to come,” you’re likely in for a long, rocky road to ROI. Those who get the most out of their systems are the ones who make it work for them. They keep the content fresh, they trial and error promotions, they track sales data, they streamline the content process, they go with systems that give them the greatest deal of autonomy, and the list goes on and on.